Historically, horses worked on farms and served in battles - as well as being ridden. Withthe introduction of agricultural machinery, fewer plough horses were needed and the war horse is confined to the history books. Today, there are other work situations for these versatile creatures. What is expected of the horse? Is it the right shape, size, colour and age? Does the horse have a suitable temperament for the work? These points may seem obvious, but it would not make sense to select a horse fortraining, for example, as a Drum Horse, if it couldn’t carry the weight of the drums! The people who select horses for specific work know what to look for and can spot horses that have potential for the job in question. Some horses are bred for the work to ensure certain traits are kept. These huge coloured horses are used most in British Pageantry. They have to be a big breed, usually Shires, to carry the weight of 2 enormous silver drums, the drummer and all related paraphernalia. They also have to be exceptionally well mannered and even tempered,because they are expected to stand still for hours, with drums banging in their ears and the drummer’s arms moving quickly up and down behind them. With all this going on, all the drummer has to control the horse with is his feet, so he must be able to trust the horse to stand still! A horse that could not cope with loud noises wouldn’t last long in this training. Horses have a built-in survival instinct called fight or flight. To escape danger in thewild, a horse would gallop away. This instinct has to be adapted, through training, for the work involved (otherwise out-of-control, frightened horses would be bolting in all directions, causing danger to themselves and everyone near them). Horses are taught to remain calm, accept the halter and stand still from a very early age, through human contact. 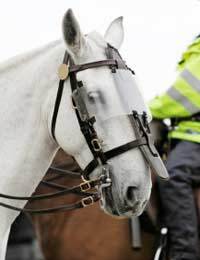 For example, the inexperienced police horse, aged between 4 and 7 years, will go through a gradual desensitisation process during its training. This is to build confidence and promote trust between horse and rider, by being exposed to flapping flags, noisy crowds, being touched by different materials, and other external stimuli. Training takes several months and is never rushed. Good trainers appreciate that each horse is an individual. Knowing why horses respond to events in certain ways, and learning how to adapt that behaviour, is part of the trainer’s expertise. Some aspects of the horse’s temperament are down to its breeding; but behaviour can be influenced through understanding the psychology of the horse and applying this in training. Patience and reward are crucial to this. Training horses is never a matter of physically overpowering them, but more a way of teaching them to instil their trust in the rider as a leader and the safe place to be. They are herd animals andwould naturally entrust themselves to the herd leader for survival. Horses are by nature social creatures that look out for each other and form close bonds within their groups. Training them for work of any sort requires an understanding of how they think and applying that knowledge to desired behaviour, relevant to the tasks we ask of them.